Back on October 17th, 2005, in reaction to the majority of players dressing like they just got done shooting a “Cash Money Millionaires” music video, NBA commissioner David Stern announced the implementation of a formal dress code. 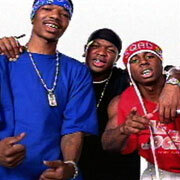 Out with the do-rags, chains, and baggy shorts, and in with the ties, dress socks and cuff links. However, while Stern was imagining a league full players looking like they were fresh off of Wall Street, the players themselves had other plans. In rebellion to Stern cramping their style, the men of the NBA have run wild within the confines of the dress code, and I couldn’t be happier about it. Wow, simply wow. Talk about going Harden in the paint. The salmon pink variety of paint that is. Also I love the subtlety of the bow tie. 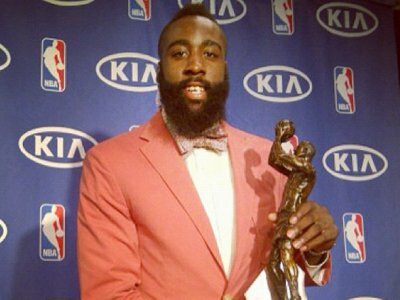 Typically bow ties are very “out there” but with a little coverage courtesy of Harden’s epic beard, this one works quite nicely. Throw in the 6th man of the year award as flair, and this is a great starting point. A lot to love here. The subtle baby blue and yellow cross hash pattern of the jacket, the matching baby blue tie, the blinged out tie clip, the tortoise rimmed glasses, and a pretty slick watch to boot. My favorite part of this ensemble however is the flamboyantly colorful, plus size pocket hanky with matching finger wrap. Great coordination all around. Bonus points for being during the Finals. 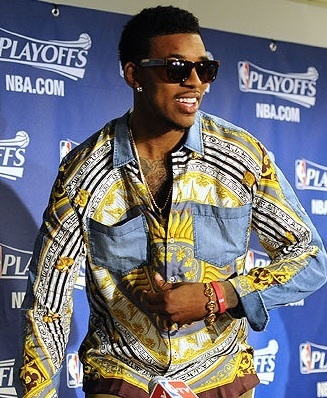 I know December 21, 2012 has already come and gone and the world didn’t end, but Nick Young’s Mayan Calendar style shirt ended fashion as we know it. I love the dual pockets in the front, the underrated wrist flair, the nice display of chest hair, and the fact that he’s wearing sunglasses indoors. All in all a stellar look. It didn’t take long for ole Stevie to adapt to life in Los Angeles. 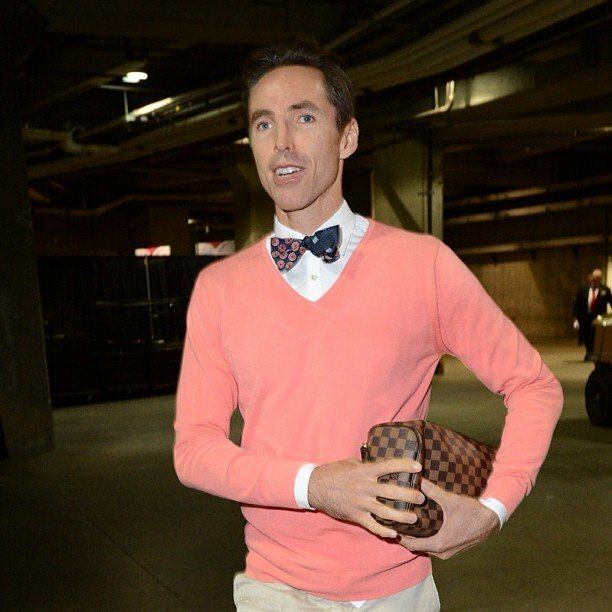 I really enjoy the pink sweater and bow-tie combo, especially since its really two bow-ties in one. I’m not sure how I feel about the murse, (man purse) but since it’s a two-time MVP we are talking about here, I’ll let it slide. It’s the most wonderful time of the year! My last few Christmas days have been dominated by a full slate of NBA viewing so it’s only fitting that we get some festive garb on this countdown. CP3 and Blake are in perfect harmony on the court so it makes sense that it would extend off the court as well. 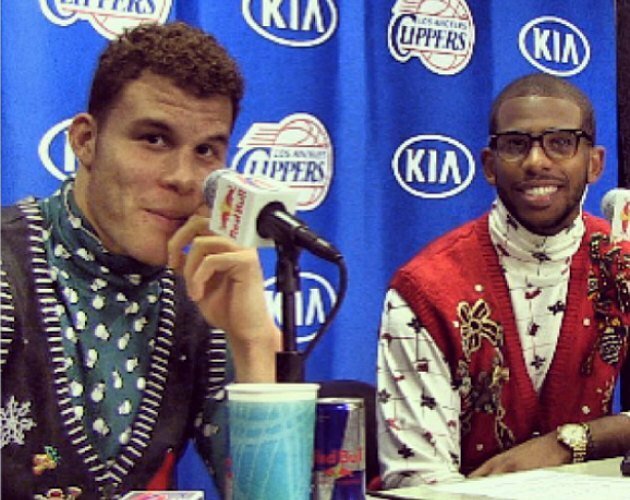 Strong use of turtle necks by these two, and very much like the Cliff Paul (of State Farm fame) glasses that CP3 is sporting. 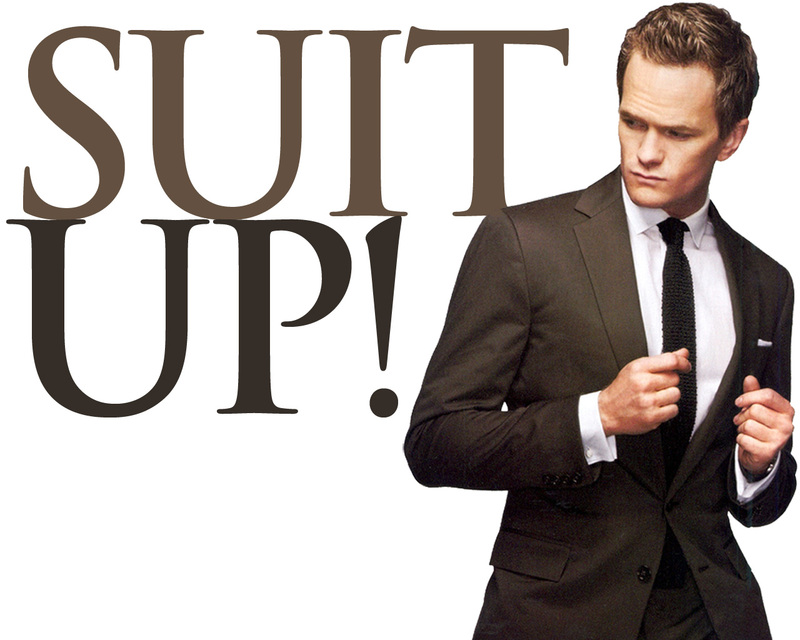 Here at Suit Up! we are real big on Patriotism. Now I know this was at the Olympics which is technically outside of big bad Stern’s jurisdiction but these outfits were to good to pass up. These two are used to winning Championships together, but this summer they competed for a Gold Medal (USA came up on top of course). Pau is a tommy gun and cigar away from being an old time gangster from Chicago, and I’m a big fan of what team USA did with their ties. 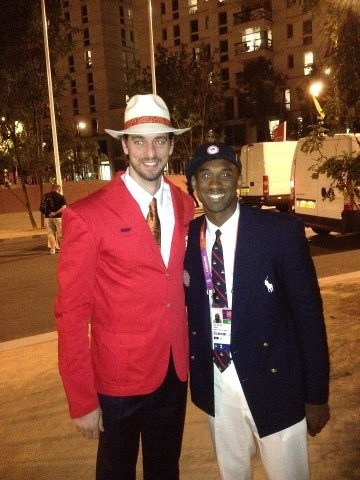 The whole Olympic basketball experience was extremely rewarding, including the off-court gear. 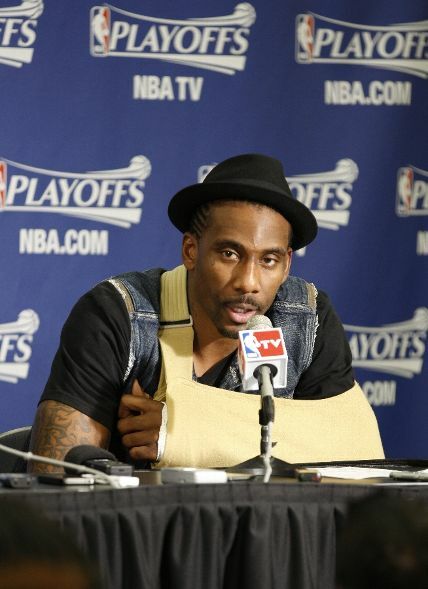 Notice how Amare seamlessly and fashionably integrates his sling into his ensemble. That is definitely the Rolls Royce of arm slings. Very solid play with the fedora as well. I really like the tilt he is rocking and the fact that he still showcases his cornrows. The denim vest is the icing on the cake. 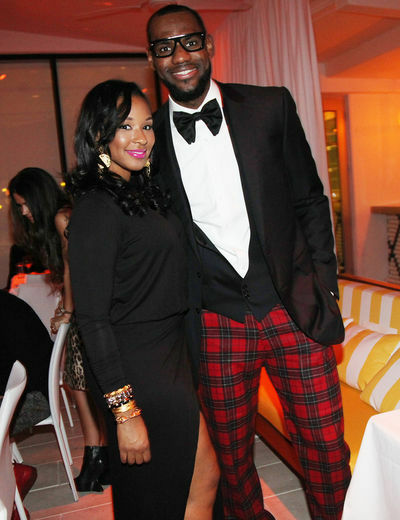 LeBron doing it big on New Years (and I’m not talking about the girl he’s with). Classic LeBron glasses and a great oversized bow tie, but really this outfit is all about the pants. He’s taken a classic lumberjack pattern and used it efficiently and effectively in a formal setting. No easy task. Real strong showing from the reigning MVP. LeBron may have won the finals and the MVP, but Durant tops him in this list. Kevin is rocking a great neon print tee, an awesome light blue suit, and some killer grey vans. This outfit has a casual formality that would make even Calvin Klein jealous. 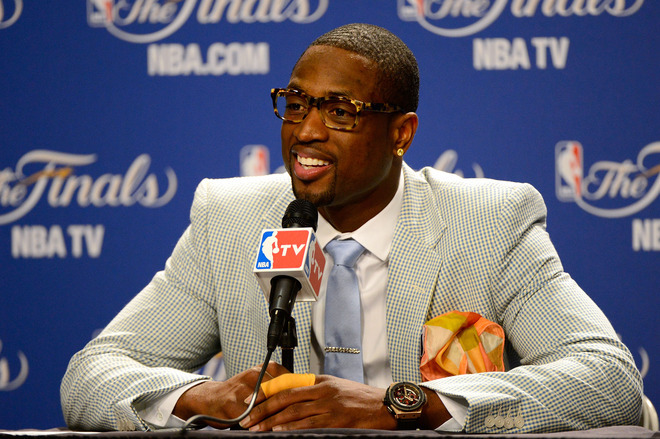 And don’t sleep on the black pocket hanky, nerd glasses and the dual wrist flair…the devil is in the details. 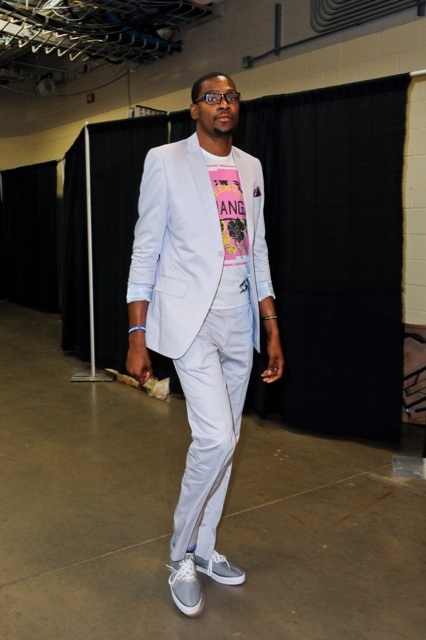 This outfit is almost as smooth as Durant is on the offensive side of the court. And your undisputed champion. Not much needs to be said. This is the simply put one of the best outfits of all time. The beauty lies in it’s simplicity. Combine some basic khakis with a juggernaut of a shirt, top it off with some real sweet glasses and you get our number one ensemble. 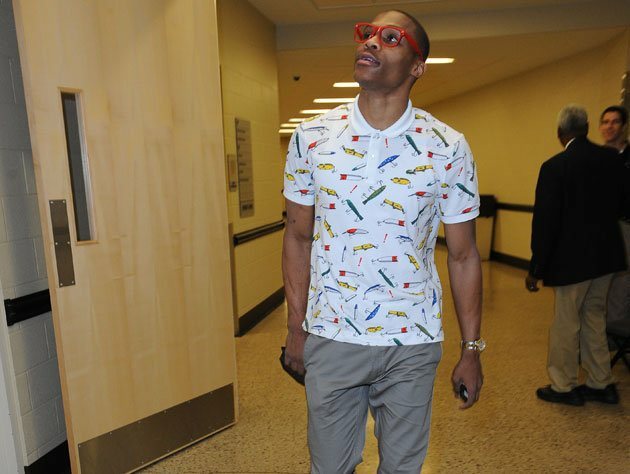 There must be something in the water in Oklahoma City.